During the recovery of encrypted files to any destination that doesn’t support encryption, Active@ UNDELETE creates temporary (*.EFS) files. These files can be decrypted later at any time by using the File Decryption Tool. Use the command tools and select Decrypt Files from the main menu. From the Tools tab in the command bar, choose the Decrypt Files command. 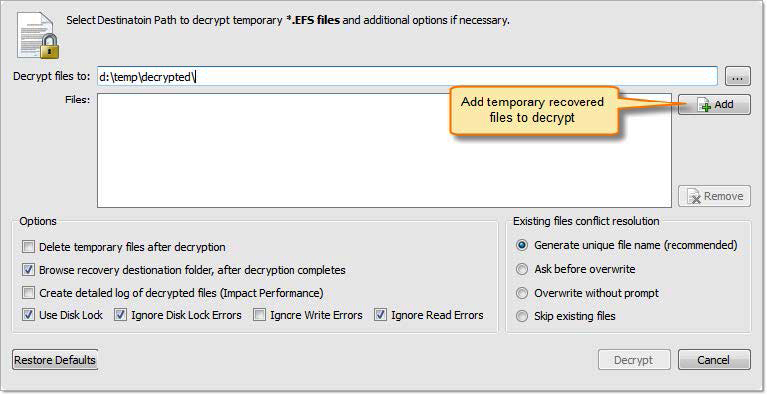 Add temporary recovered encrypted files (*.efs) or open the Decrypted Files log (*.txt) created during recovery by using the Add button. All temporary recovered encrypted source files will be deleted after decryption. The folder where files will be decrypted will be opened by the default OS files browser. The log files will contain more detailed information about the forthcoming process. The source disk will be locked during the file recovery process. The disk will be unlocked as soon as the process is completed. No error messages will appear and all read errors will be ignored during the recovery process. If a file with the same name exists in the destination folder, then a file with a unique name will be generated to avoid overwriting. If a file with a certain name already exists in the destination folder, the application will ask the user for a specific action to take. All files will be overwritten even if they already exist in the destination folder. If a file with the same name already exists in the destination folder, recovery of that file will be skipped. Set other options if necessary and then click the Decrypt button to complete the task. When process completes decrypted files will appear in destination folder.